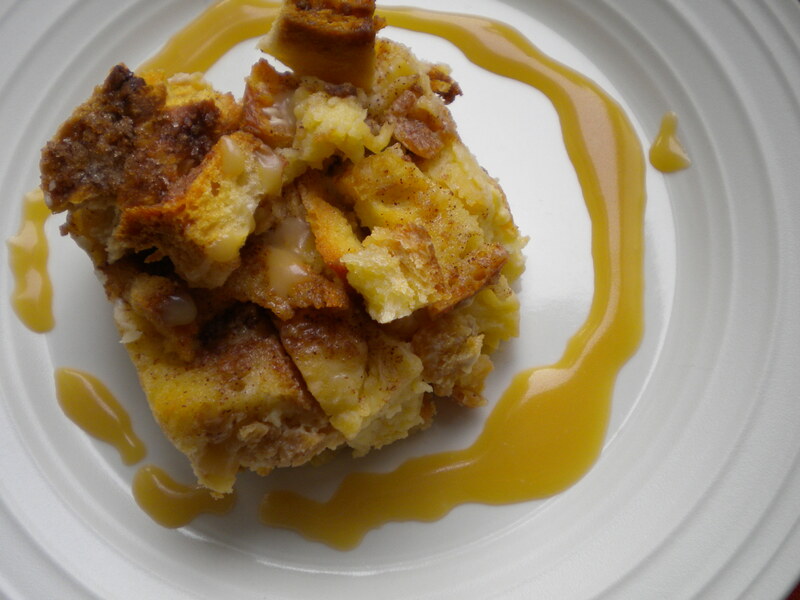 Bread Pudding with Rum-Brown Sugar Sauce – Voila! I love redemption recipes. These are defined as dishes that are successful upon the second attempt after a failed first try. Bread pudding is one such recipe. I tried making an apple cinnamon bread pudding and it did not work well at all! It lacked any flavor and just tasted like bread soaked in milk. Ew. I had some luck with a butternut squash bread pudding, but I still needed a dessert pudding and here we are. I can proudly say that this recipe is amazing. We’ve been eating our way through the whole pan for about a week. We can’t stop and either will you! 1. Combine brown sugar, 1 tablespoon of sugar and cinnamon in small bowl. Set aside. 2. Spread cubed bread pieces into one layer on two baking sheets. Bake, tossing occasionally, for about 15 minutes, switching trays from top to bottom racks halfway through. Cool bread cubes for about 15 minutes, reserve 2 cups in separate bowl. 3. Meanwhile, combine golden raisins and rum in small microwave proof bowl. Heat in microwave for about 30 seconds, set aside to cool. 3. In a large bowl, whisk egg yolks, 3/4 cup sugar, vanilla and salt. Whisk in cream and milk until combined. Add remaining 8 cups of bread cubes, raisins, and toss to coat. 4. Transfer mixture to 9×13 baking dish and let stand, occasionally pressing cubes into custard, until cubes are fully saturated, about 30 minutes. 5. Spread reserved bread cubes evenly over top of soaked bread mixture and gently press into custard. Using pastry brush, or evenly pour, butter over unsoaked bread cubes. 6. Sprinkle brown sugar/cinnamon mixture evenly over top. 8. Let custard stand for about 15-20 minutes before serving. Serve warm with rum-brown sugar sauce. 1. Whisk brown sugar and cream in small sauce pan, set over medium heat. 2. Continue to cook, stirring frequently until it begins to boil. 3. Whisk in butter and continue to boil another minute or so. Remove from heat and whisk in bourbon.